Description: In 1961 Fisher-Price introduced their one and only toy that features Hannah-Barbarba's Huckleberry Hound. This one-year-only toy was sold exclusively at Sears and is very hard to find and very desirable among Fisher-Price and Hannah-Barbara collectors. Fisher-Price only made 2 Hannah-Barbara toys, 1961's #711 Huckleberry Hound Xylo and 1962's #712 Fred Flinstone Xylophone. Both were one-year-only toys, both were sold exclusively at Sears, and both feature a xylophone with a pivoting base. The #711 Huckleberry is the hardest to find. 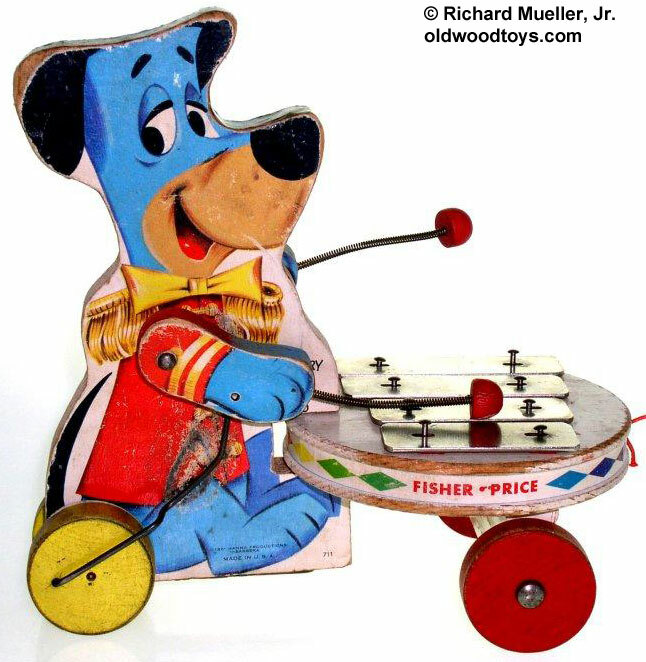 FPT4333 - Wooden cut-out Hanna-Barbara Huckleberry Hound figure attached to a round white pivoting base with 4 metal xylophone keys on top. Huckleberry Hound is a blue cartoon dog wearing a red band jacket. He has 2 seperate wooden cut-out movable arms with a springy mallet in each hand that has a red wooden bead on the end. The keys are mounted on a round wooden base that moves from side to side as the toy is pulled. The base has paper a lithograph on the sides of multi-colored diamonds and the words "Fisher-Price" in red. This toy rolls on 4 wooden wheels, 2 yellow wheels under Huckleberry and 2 red wheels under the xylophone. Also see 1962's #712 Fred Flinstone Xylophone.